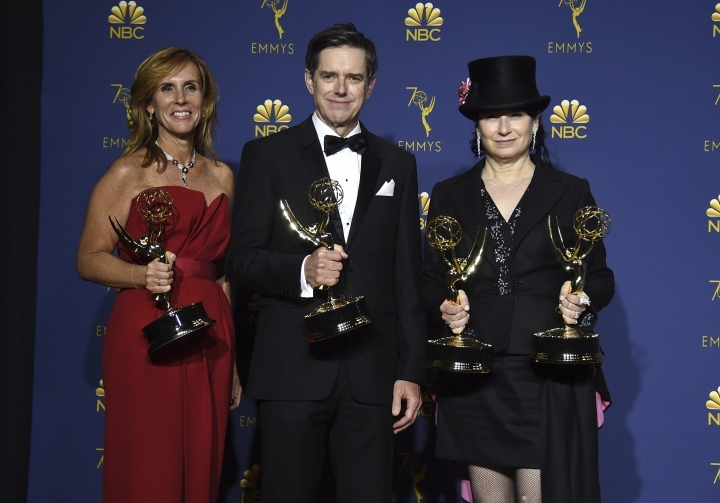 NEW YORK — There were princess looks and stars pretty in pink, liquid metallics and a contingent in red for TV's big night at the Emmy Awards. 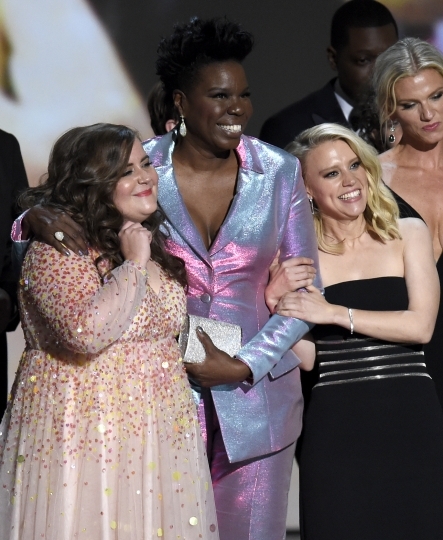 Claire Foy in custom Calvin Klein by Appointment, Jessica Biel in ruffly Ralph & Russo and Scarlett Johansson in Balmain represented in white Monday, as did RuPaul in a jacket adorned with Andy Warhol designs of black Statues of Liberty on one side. 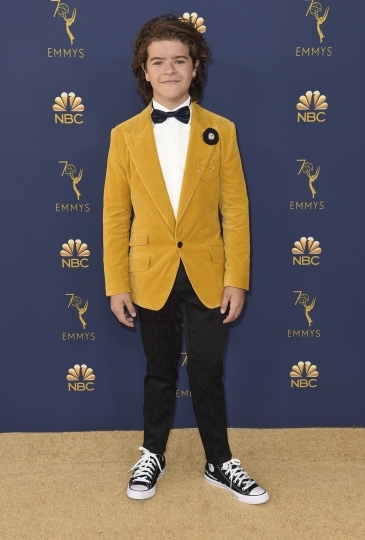 Yellow came in a variety of shades, from neon (Regina King) to mustard (16-year-old Gaten Matarazzo) to gold (Gwendoline Christie) to the lightest Easter hue, worn by a few. And then there was Tracee Ellis Ross. Love her or scorn her in voluminous Valentino Haute Couture with a puffy top that surely set a world record. 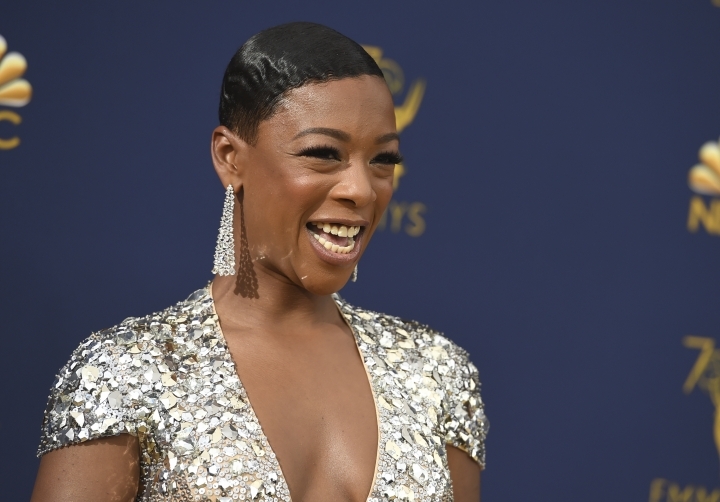 "I almost shed a tear when she hit the carpet," said Julee Wilson, fashion and beauty director for Essence magazine, of the "black-ish" star. "She cements her status as a style icon every time she gets dressed. But then again, she was birthed by Diana Ross, so it makes sense." Other best-dressed votes for Ellis Ross rolled in after the parade of fashion on the Emmys gold carpet in Los Angeles. "If you plan to make the carpet all yours, it makes sense to go all out and do the volume of Valentino Haute Couture," said Avril Graham, executive fashion and beauty editor for Harper's Bazaar. "Absolutely perfect." It was bright pink. It had volume to spare all the way to the ground. Sarah Conly, executive fashion market director for Cosmopolitan and Seventeen magazines, also voted "yes" for Ellis Ross, but she appreciated some of the night's Old Hollywood glamour as well. 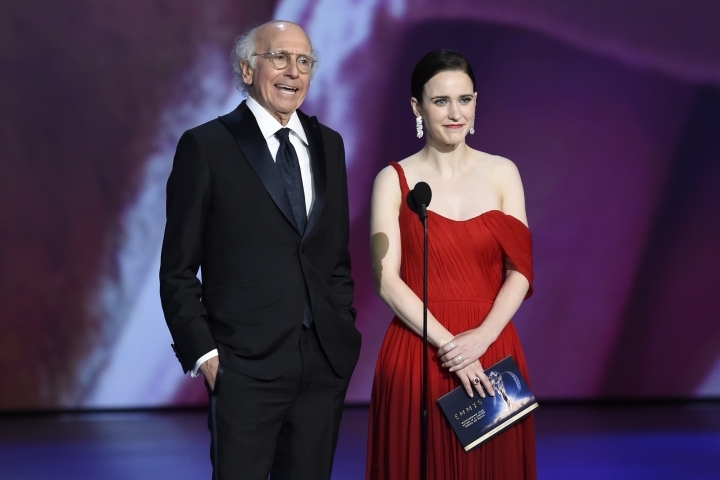 Particularly, Rachel Brosnahan's asymmetrical ombre red from Oscar de la Renta, with a delicate drape effect and a matching red lip on the "Marvelous Mrs. Maisel" star and winner of her first Emmy. Her ears were adorned by diamonds courtesy of Tiffany & Co.
Also on Conly's stunning list: Zazie Beetz of "Atlanta." There's no way to overstate the chunky blue tone jewels that adorned armor-like pieces falling down each shoulder from the halter neck of her body-hugging velvet Ralph Lauren gown. "The detail on the cutouts on the shoulders were exquisite," Conly said. Erin Cunningham, senior fashion editor for the millennial-focused style site Refinery29, lauded Ellis Ross for never holding back, fashion wise, but also among her top looks was actress Poppy Delevingne in seafoam, ruffle-caped Giambattista Valli couture. It included an oversized silhouette that began just above the knee. "The color is unexpected and a rarity on the red carpet, and she topped the look off with a cute ribbon bow in her hair," Cunningham said. Delevingne also sported $200,000 worth of Amwaj citrine and diamond earrings, plus ring. Cunningham noted pink had a renaissance in shades that felt less saccharine than usual, including Ellis Ross. 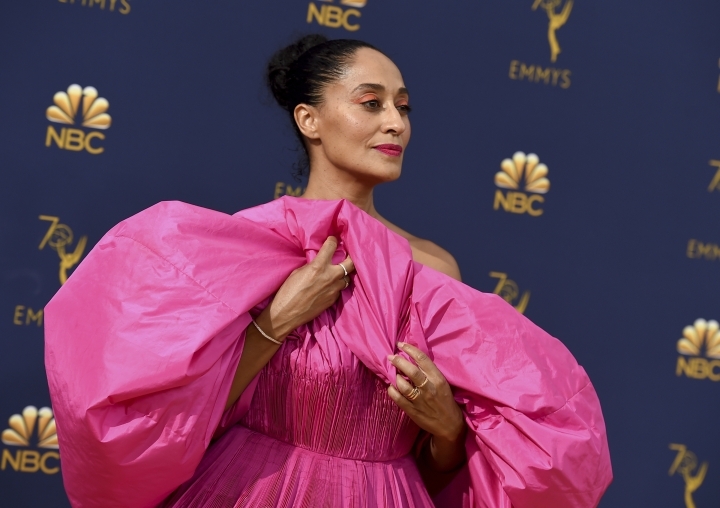 "There was Tracee's magenta dress, Leslie Jones' holographic Christian Siriano suit (in pink and blue) and Thandie Newton's one-sleeved bubblegum pink gown," she said, referring to Newton's one-shoulder Brandon Maxwell that looped at the neck in a long cape effect on one side. Supermodel Gigi Hadid wore the look on Maxwell's recent New York Fashion Week runway. "Red carpets are always filled with your classic black and 'naked' dresses," Cunningham said, "and it's nice to see stylists pushing their clients a bit more when it comes to color and silhouette." Conly was also a fan of Newton's dress. "She epitomizes the dreamy princess look that was so popular," she said. So where do these people shop? Well, while others ripped their outfits off runways or wore custom gowns, Meghan Mullally purchased her Carolina Herrera sheer black look with floral detailing online. Kristen Bell wore a classic white column gown from an unexpected brand, Solace London. 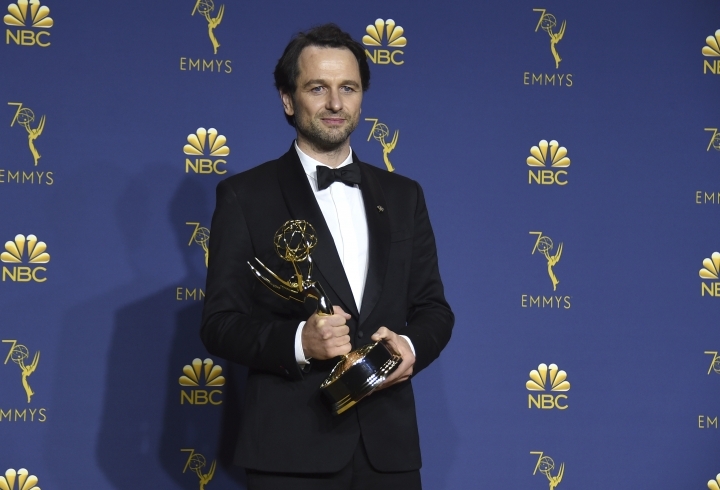 While basic black is always abundant, Wilson had kind words for Keri Russell of "The Americans," for elevating the color in Zuhair Murad couture. It was beaded black crepe with a peplum ruffle in feathers atop a black pleated chiffon skirt. Wilson's verdict for Russell: "Feathers, legs and cleavage, oh my!" 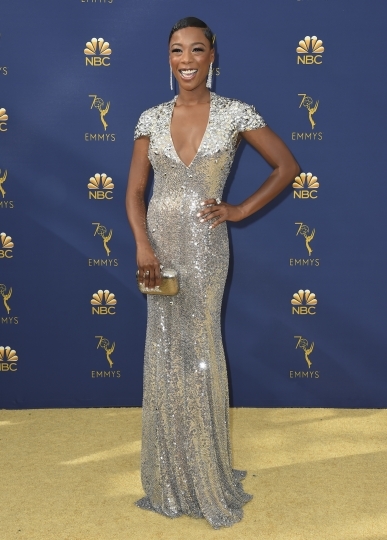 Wilson was also a fan of Issa Rae's pale blue Vera Wang custom look, with 3,000 crystals on a top that fell to the ground with a slit revealing what appeared to be loose, matching trousers. The silk V-neck was actually a jumpsuit with a split away skirt, the crystals sewn on by hand. "There is nothing more awkward then a skirt and pant hybrid gown, but she pulls it off with such grace and ease," Wilson said. Penelope Cruz was in the white camp with a touch of soft gray, in feathered Chanel, landing on some highlight lists. 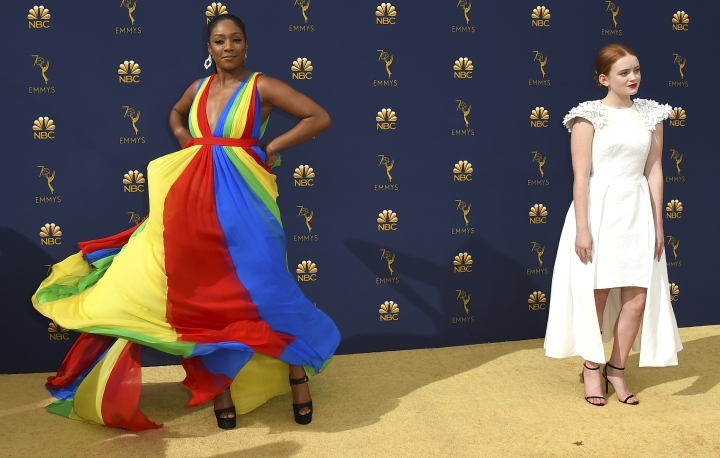 Tiffany Haddish was a breath of fresh air and a rainbow at the same time, in bright stripes of green, red, yellow and blue, representing the Eritrean flag in honor of her dad, and courtesy of Prabal Gurung. 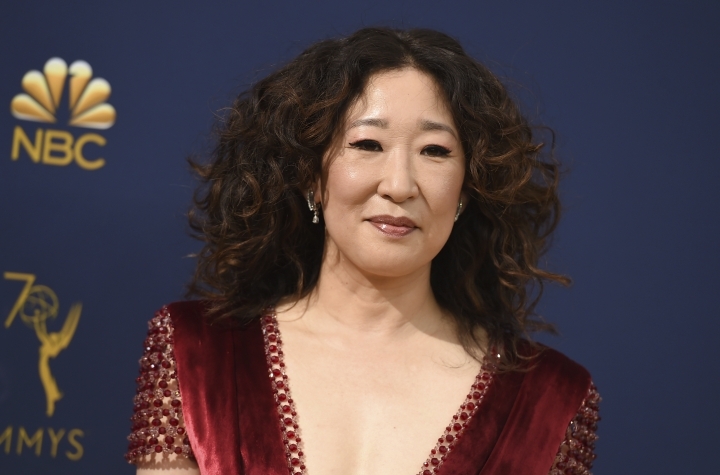 Sandra Oh wore crimson Ralph & Russo, though she fell short of making history when she did not win an Emmy. 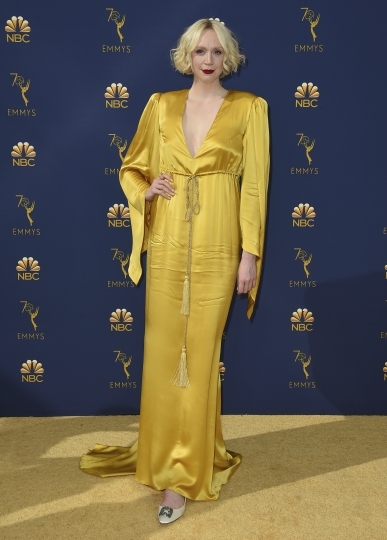 Offsetting all the yellow, red, white, metallic (hello, Samira Wiley in Jenny Packham) and jewel-crusted looks was Dakota Fanning in gorgeous Dior Haute Couture. It was in a shade of jade, made of a creased pleated chiffon with a crossover front, tiny straps and a tied back. 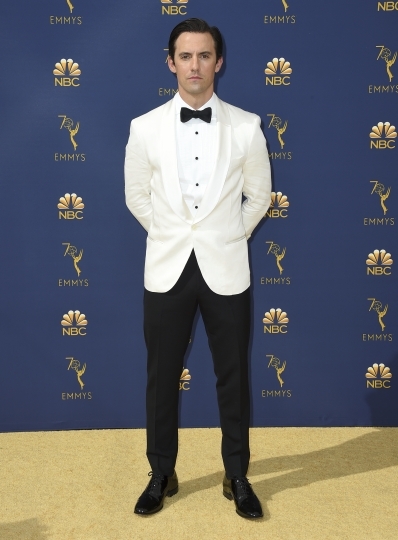 As for the guys, Milo Ventimiglia wore a white evening jacket, but John Legend went for a navy blue tuxedo with black lapels from Gucci. 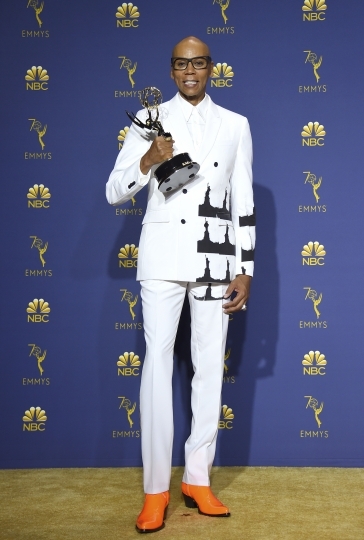 "I love when a fella strays from the traditional black tux and nails it with something a bit unexpected," she said of Legend's look. His wife's sparkly sheath gown draped in silk tulle? Not so much. It was fully beaded in geometric antique silver motifs from Zuhair Murad. "Chrissy is stunning, smart and sassy, but this dress is the exact opposite," Wilson said. "That bodice, neckline makes her look matronly." 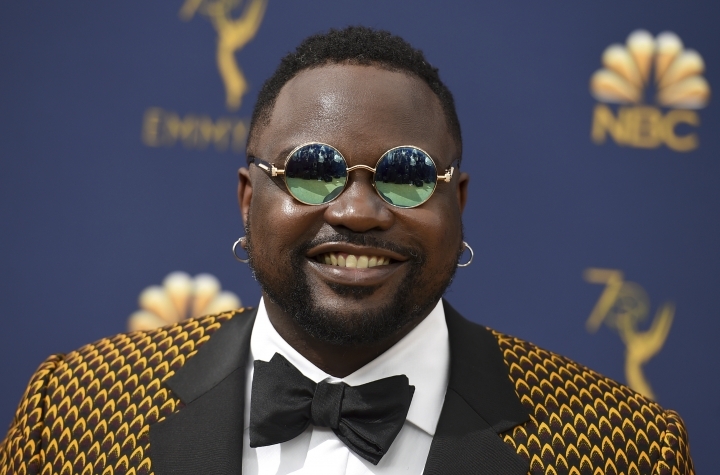 Brian Tyree Henry of "Atlanta" went for a yellow-and-black print jacket. 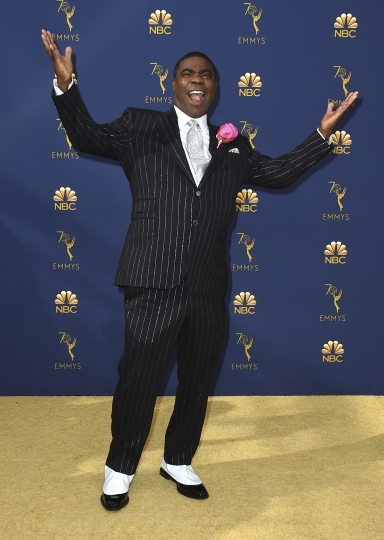 Tracy Morgan went for pinstripes, head to toe, spats on his dress shoes. 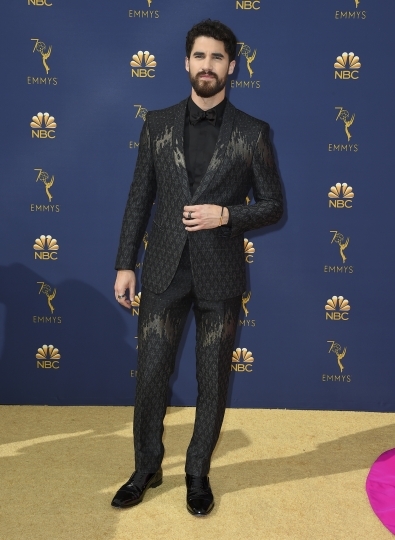 Darren Criss stood out in a John Hardy look in a black diamond print with silver zigzags. Peter Mackenzie showed up in a kilt. But back to Ellis Ross and her big statement in the big color of the night. 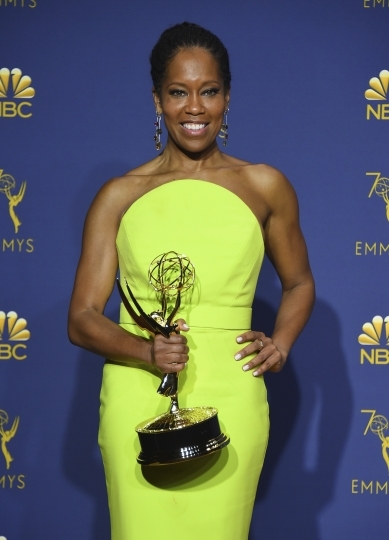 "She really worked the volume of the dress on the red carpet," Conly said, "and owned it rather than it owning her."